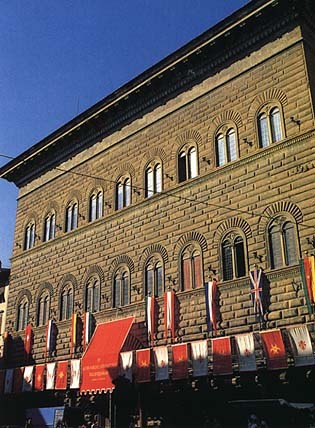 When power returned to the popolo grasso at the end of the 14th century, an oligarchic regime was established in Florence and a small restricted number of the merchant middle class governed the city for about 40 years and fostered an extremely active foreign policy, costly as far as the continuous wars were concerned, but nevertheless capable of halting the expansionism of the Visconti and of considerably enlarging the territory of the city-state by conquering Arezzo, Cortona, Prate, Pistoia and Pisa. The fact that Florence had Pisa and its ports (Porto Pisano and then Livorno) at its complete disposition made her a sea power and the uncontested "most complete and most perfect economic power of the West" (Y. Renouard). One of the consequences, internally, of the considerable costs of financing the wars was a reform of the tax system which led to the institution of the Catasto or Land Register (1427), a device by which it was theoretically possible to tax everyone according to their means, taking into account the conspicuous wealth in real estate which had previously been practically exempt. These same years witnessed a growing opposition to the oligarchy which was to ably exploit the malcontent of the populace. That part of the middle class which had been excluded from power joined arms with the people and found a leader in Giovanni de' Medici, head of the richest and most powerful company of Calimala. 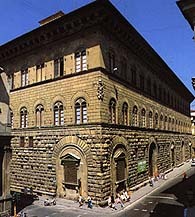 After the death of Giovanni (1429) the contrast was accentuated while the current of opinion favorable to the Medici continued to grow. The oligarchists headed by Rinaldo degli Albizi tried to eliminate Cosimo, Giovanni's firstborn, with defamatory accusations, but they only succeeded in sending him into exile (1433) from which he was recalled only a year later by a new Signoria that was favorable to him. From this moment on Cosimo was lord of the city, although he attempted to conceal the fact, leaving the old republican institutions intact, but emptied of any effective power. The last of the great city-states in central Italy, Florence, too, fell under the power of a single man, and it was the beginning of the principality which however did not formally take the place of the republic until about a hundred years later, in 1530. Cosimo, who died in 1464, was followed by the mediochre Piero the Gouty (14641469) whose son, Lorenzo the Magnificent, was to continue his ancestor's dissimulating policy up almost to the end of the century, maintaining the traditional offices, but with no doubts as to what he was to all effects: the true lord of Florence. During the years in which the merchant oligarchy governed Florence and in the early period of Medici rule, the increasingly frequent contacts with examples of Greek and Roman antiquity gave rise to a new spirit and the city became the center in which Humanism was forged. Man considered himself the ultimate end, eager for rational knowledge and bent on affirming his dominion over the nature which surrounded him and the history which preceded him. Literary culture, the sciences, arts and human activities in their entirety attain a complete spiritual fusion, in a unique equilibrium which forgathers artists, craftsmen and scientists in a single platonic ideal of eternal truth and beauty. 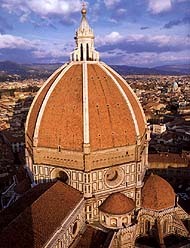 Filippo Brunelleschi activity falls at the dawn of this golden priod in European intellect and culture. Between 1420 and 1446 he created a group of works which were to represent one of the most important moments in the history of Florentine architecture and town-planning. 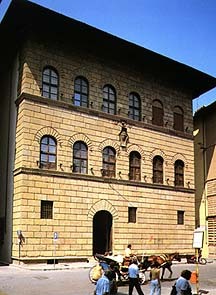 Brunelleschi's works take their place in the urban framework which can be traced to Arnolfo di Cambio and which the city had inherited from the late Middle Ages. Synthetically they might be considered a "modernization" of medieval buildings. 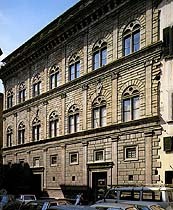 But the inventive power and newness of vision inherent in the work of the great Florentine architect were such as to lead to the affirmation in medieval Florence of a new rational order which transforms any pre-existing meaning. 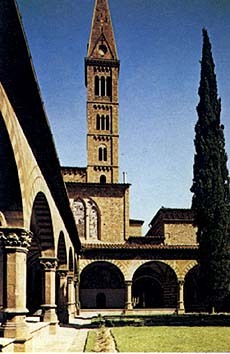 It is then thanks first of all to Brunelleschi and secondly to the other exponents of the architectural culture of the early 15th century that Florence, while maintaining its urban layout of the late Middle Ages practically intact, was to present itself from then on as the "Renaissance city" par excellence, idealized by the humanists.